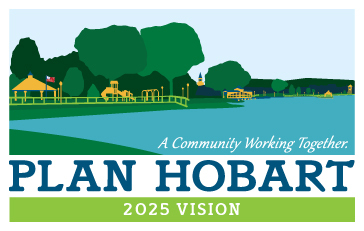 Plan Hobart is about a community working together to create a framework that will guide our city for the next 10 years through a document called a comprehensive plan. The comprehensive plan relies on public input help to create this framework, which occurs approximately every 10 years. The first city comprehensive plan was completed in 1959 and over the years several updates have been done with the most current city comprehensive plan adopted in 2003. Help the city Plan Hobart 2025 and take The Survey now! A comprehensive plan is required and regulated by Indiana State Code "for the promotion of public health, safety, morals, convenience, order, or the general welfare and for the sake of efficiency and economy in the process of development." To learn more about comprehensive planning please reference IC36-7-4-500 through IC 36-7-4-512. Specific codes such as IC36-7-4-502 and IC36-7-4-503 present you with what is required by Indiana State Codes. (1) A statement of objectives for the future development of the jurisdiction. (2) A statement of policy for the land use development of the jurisdiction. (3) A statement of policy for the development of public ways, public places, public lands, public structures, and public utilities. Further details are presented in the PDF and any question or concerns are open to be addressed. All the sessions have taken place, and the attendance has been great! If you have missed any of the sessions and want to see what was discussed, just simply click on the links below. The next session is Monday July 21, 2014 from 6-8 at the Community Center! This will be the time to ask any questions that have not been answered or catch up on any topics you may missed. Hope to see you there! Monthly updates of the comprehensive plan will be presented at the planning commission meetings which are held on the first Thursday of every month. These meetings are open to the public. Why does the plan require an update? Who is involved in the development of this plan? What if I choose to not participate in the comprehensive plan update? When will the developments shown in the plan begin? What if I don't agree with what is in the comprehensive plan?